Directions for different zodiac and relative ideal entrance. Cancer, Scorpio and Pisces – People with this zodiac owning East direction and should have the entrance of home in this direction only. 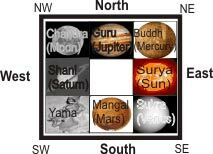 Taurus, Libra and Aquarius- People with this zodiac owning West direction, so they must have the entrance in the West direction which is consider ideal for them. Aries, Leo and Sagittarius- People belonging to this zodiac have North direction and must keep their entrance of home in North. Gemini, Virgo and Capricorn- People having this zodiac owning South direction and must keep their entrance in South.